GAINESVILLE -- Just when you thought Florida quarterback Tim Tebow couldn't have anymore pressure dumped upon his shoulders, one Gainesville minister posted this sign less than a mile from the Gators' practice field on Monday morning. Eric Brown, the 31-year-old minister at Gainesville's Campus Church of Christ, says he hopes Tebow sees the sign while the Heisman Trophy winner drives to and from campus. If you're wondering about the Bible verse, Matthew 6:13, you might already know it. It's the final few lines of the Lord's Prayer: "And lead us not into temptation, but deliver us from evil: For thine is the kingdom, and the power, and the glory, forever. Amen." Pause for a moment to let that thought role around in your brain. 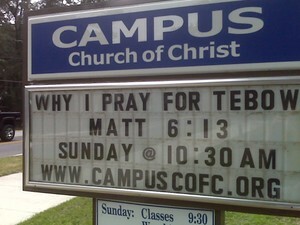 For some, Tebow is apparently much more than just a leader of the University of Florida football team. Brown says he has been preparing a sermon for nearly a month about the Bible verse and, after watching ESPN College GameDay a few weeks ago, decided to add a few thoughts about Tebow to his message. Many media outlets have chronicled Tebow's use of fame as a platform for his faith. While Brown says he did attend Saturday's game between No. 12 Florida (3-1) and Ole Miss (3-2), the minister says the sign, located on S.W. 2nd Avenue only a few blocks west of campus, has nothing do with Florida's 31-30 loss to the Ole Miss Rebels. "I'm going to pray that [Tebow] is true to his faith because if he falls and gets caught up in some kind of scandal it will be bad for Christianity," Brown said. Brown doesn't know Tebow but says the quarterback is an important role model. The minister says if Tebow gets into trouble, then the image of Christians could suffer. "I know the story of David, so we know it's possible for all of us to fall," Brown said. Brown, a graduate of Texas A&M and a native of Wichita Falls, Texas, is a graduate student studying mental health counseling at the University of Florida when he's not leading worship at Gainesville's Campus Church of Christ. Brown says you can listen to his sermon on the church's website, www.campuscofc.org.